Properties in Province of Viterbo average 4.7 out of 5 stars. B & B LA DOLCE VITA is an oasis of tranquility just a few kilometers from the sea. 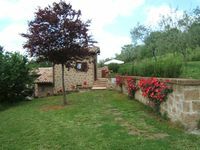 Property 53: B & B LA DOLCE VITA is an oasis of tranquility just a few kilometers from the sea. Everything we could have wished for! A wonderful quiet place... with friendly helpful host (Selita). Nice little patio, comfortable bed, pretty garden, very nice breakfast. We will return for sure! Grazie mille! Nice reasonably priced room. Big room. Good breakfast of pastries. Shared bath, but we were the only guests. Would certainly return. Adriano (speaks English) and his Father were great. Used Uber to get there from the cruise ship. Make sure to have the address. Taxis are hard to get.